You will get a lot of slot features on 5 reels, see them all http://www.slotsnetwork.com/5-reel-slots here. Sienna Howell-Holden, Glenda Warkentin, Evelyn Chew, Carl Kennedy & Alysa Van Haastert in SHE HAS A NAME. Our mission is to tell stories that change people’s lives. Burnt Thicket Theatre is an independent company producing live theatre that brings awareness to real issues in our community, planting seeds for positive social change. Our vision is a world of hopeful people who know their value in the midst of brokenness and who work together towards a shared future marked by justice, equality and love. leading artists and audiences to live more intentionally for the common good of Canadian society. We believe the art of theatre makes its own unique contributions to the common good through the roles it plays in human action—as an artistic act of oblation, as an act of co-creation, as a laboratory of human action, as a potentially transforming encounter with presence, and as a public space for incarnating story. By “common good” we mean the conditions that promote the human flourishing of persons and the relationships between persons and between communities in our world, mindful of the two inseparable levels of individual persons and our inter-relatedness as a wider society. In 2007 Burnt Thicket Theatre was created in Calgary by founding artistic director James Popoff and current artistic director Stephen Waldschmidt. Our inaugural production HOCKEY DAD: A PLAY IN 3 PERIODS saw nearly fifty performances across western Canada, inviting audiences to family reconciliation. In producing the world premiere and cross-Canada tour of SHE HAS A NAME by Andrew Kooman, we moved people to join the work of abolishing modern-day slavery with performances in 13 cities from Halifax to Victoria. With our world premiere of WE ARE THE BODY by Andrew Kooman we called people to advocate for prisoners of conscience. EVERY BRILLIANT THING offered audiences a powerful comedy about depression, suicide and gratitude. 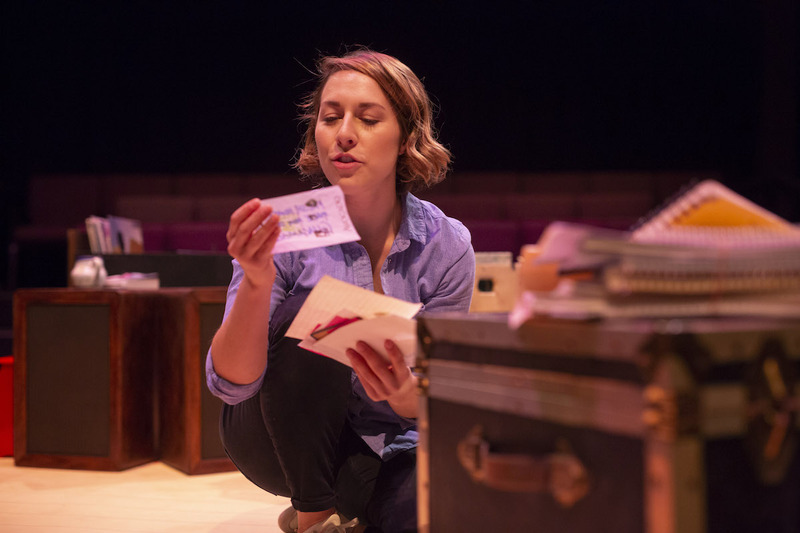 Jenna-Lee Hyde in EVERY BRILLIANT THING; photo by David Stobbe. Our productions are usually the fruit of assisting playwrights in birthing new works. Since 2015, eight new scripts by playwrights from Saskatchewan and Alberta have received development support. Our script development can be likened to midwifery for new plays, and may include commissioning funds, assistance in refining the internal logic of a story, workshop readings with an audience, and advocacy for a playwright’s new work. With over 200 performances in 25 cities across Canada, including five world premiere productions, we’re proud to call the vibrant arts centre of Saskatoon home. Burnt Thicket Theatre acknowledges that we are on Treaty 6 Territory and the Homeland of the Métis. We pay our respect to the First Nations and Métis ancestors of this place and reaffirm our relationship with one another. We’re grateful for the opportunity to create and perform here. Read more about the company’s transition in 2017 here. It’s never been more urgent to work to restore life in our world – global events threaten human rights, Canada wrestles with how to follow the stirring call to reconciliation, and so many individuals in our communities are isolated, to name just a few realities. Our original performances can powerfully move people “to live more intentionally for the common good.” We believe this kind of theatre matters. And it only happens through the collaborative faith and effort of a host of artists, donors and supporters, far beyond the team listed below. Stephen grew up in Indonesia and Ohio, before moving to Canada to marry the woman of his dreams. He works as a director, designer, and actor based in Saskatoon, after a number of years in the Calgary area and in Vancouver. Directing credits with Burnt Thicket Theatre include EVERY BRILLIANT THING, WE ARE THE BODY, SHE HAS A NAME, and HOCKEY DAD: A PLAY IN 3 PERIODS (which he co-wrote with James Popoff). Scenic design credits include Rosebud Theatre’s IT’S A WONDERFUL LIFE, JAKE & THE KID, MAY & JOE, THE SECRET GARDEN; Pacific Theatre’s GRACE, A BRIGHT PARTICULAR STAR; and Midnight Theatre Collective’s THE QUARREL. Acting credits include Persephone Theatre’s THE RESISTABLE RISE OF ARTURO UI; Rosebud Theatre’s QUEEN MILLI OF GALT, THE ROAD TO MECCA, TENT MEETING; Pacific Theatre’s CHICKENS, THE CLEARING; and five summers playing the role of Jesus in THE CANADIAN BADLANDS PASSION PLAY. Stephen holds an interdisciplinary masters degree in fine arts and theology from Regent College and a BFA in drama from University of Calgary. He’s immensely grateful for Kirsten’s support along with their three kiddos, Caleb, Asher and Eden. Tim is an actor, playwright, pastor, care-worker, musician, vinyl record collector and all around dilettante. With a broad range of training and experience in both theatre and theology Tim is committed to helping people tell the stories that help us make sense of life. Acting credits include GODSPELL (Pacific Theatre), WOLF AT THE DOOR (Otherwise Productions), WE ARE THE BODY (Burnt Thicket), BOEING, BOEING, PRIDE AND PREJUDICE and ART (Persephone Theatre). Tim lives in Saskatoon with his lovely wife and fellow theologian, Amy, and their very active one year old son, Oswald. Barb Macpherson, Carol Tebay, Emily Thomas, and Gloria Mitchell.